A mostly black community with its roots in farming, Goslyn, Virginia lay just south of the State’s Capital. The once small, close-knit county had grown rapidly in the past two decades and boasted a population of just over fifty thousand. But the county’s crime stats had grown as well, and the latest offenses included several break-ins and rumors of a meth lab. Time had brought many changes, and many of the longtime folks of Goslyn no longer recognized their community and longed for days gone by. Goslyn PD Detective Olivia “Ollie” Winston loves her family and friends and shows it through her sense of humor. Just like her neighbors, she too worries about the recent events, and it’s her job to find out who’s behind the crime spree. While investigating three burglaries, Olivia meets IRS Special Agent Maureen Jeffries who is pursuing a tax fraud suspect. Their cases are connected, and both soon discover they have much in common, personally and professionally. A really wonderful book, a delight to read. The fantastic opening chapter explained how the two young friends friendship between them was so close, and how supportive each girls family was, and the different gender preference of each girl. This set the tone for the whole book. After setting the tone, Ms McKnight moved on to present day and once again reinforced the strength and love in the family, this time through the humerous encounter between Ollie and her grandmother and the tv!!! Encounters many of us have had similar experience of. As the book progresses we are given relevant information about all her family, friends and significant others. All are which are carefully choreographed and woven into the story line in an interesting and fascinating way. Without almost realizing it odd discrepancies begin to reveal themselves, out of character behaviour is exhibited. The plot weaves its mystery and nothing is fully revealed until we reach the end of this marvelous book. One nice touch was the revelation towards the end that secret first love can be revealed and reciprocated. I think what drew me to this novel was not just the outstanding story line but the exceptional and beautifully portrayed family dynamics. A really different approach to an engaging and captivating novel. 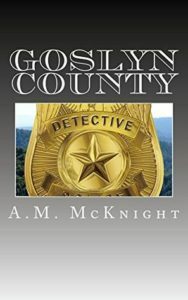 Goslyn County is a really enjoyable read and stands out from many other lesfic crime novels. It is set in a black community and has a very positive and inspiring outlook that appealed to me. The crime part of the book was well plotted and kept my attention but for me the best part was the budding romance between cop Olivia and IRS agent, Maureen. I felt it was dealt with in a very grown up way and the characters themselves had a maturity and depth to them seldom seen in the genre. Olivia and Maureen meet through working on a case and there are tensions around this as Olivia’s boss is intent on causing her problems. He implies there is impropriety and it causes the women to take things slowly until they are sure about it. I am glad the author decided on a slow burning romance as it made so much sense with these characters. The importance of family and community came through and made the minor characters so important to the whole novel. author was trying to say. the right places. Good read.